for more information or to purchase the item. Written by Janine Adams, it's one of my favorites. Not everyone cooks meals for their dogs, but many of us do make dog biscuits and treats. Janine has concentrated on dog biscuits recipes in this book. And there is a nice variety. She's included grain free biscuits and dog biscuits for dogs with special needs. 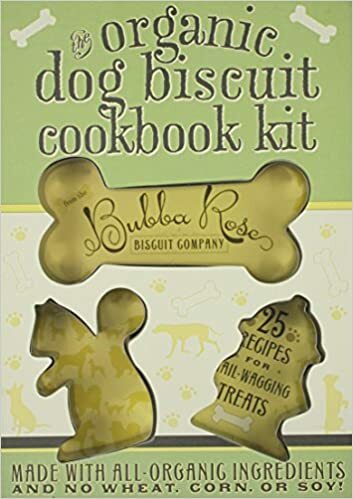 This dog treat kit (cookbook and cookie cutters) comes to us from the Bubba Rose Biscuit Company in Brooklyn, NY. The company was founded by Jessica Disbrow Talley and her husband, so that they could make preservative free dog treats. But this dog treat cookbook goes beyond that! The recipes are made from organic ingredients, and they are wheat-free, corn-free and soy-free. That makes them perfect for dogs with food allergies! Klecko, the author, is not only a master baker who has worked in some of the finest restaurants. He's also a dog owner and master story teller! You'll love the little stories sprinkled throughout the book, and your dogs will love these homemade dog biscuits! 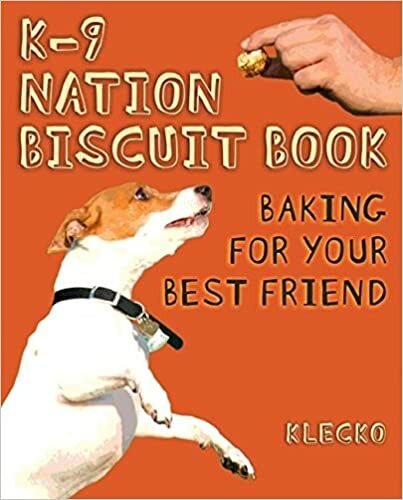 The recipes include high quality natural ingredients, and you'll find treats for dog bad breath, dog nausea when traveling, a tummy biscuit and some interesting sounding gourmet dog biscuits! This dog biscuit kit is a great way to get started. It comes with recipes, 5 dog cookie cutters, and little treat bags and labels that you can use for your dog treats. The recipes are written by Janine Adams, the award winning pet writer and columnist for Dog World Magazine. Using the bread machine to make dog biscuits is near and dear to my heart--it's so easy! And this dog treat cookbook has included dozens and dozens of tasty recipes for dog treats and biscuits. You'll find many with healthy ingredients (leave the raisins out!) and quite a few vegetarian dog treats! Some people expect every dog cookbook to have hypoallergenic recipes, but not every cookbook does. This one includes wheat flour in its recipes. If your dog is allergic to it, you can substitute barley or spelt flours. With 24 easy recipes, you’ll keep your dog happy! All the recipes are easy to follow, and use ingredients you probably already have at home-a real plus since then you’ll know exactly what is in your dog biscuit. Save money - You can definitely save money by baking your own dog biscuits. Whether you bake for your own dog or use the treats as gifts, you will save money! Homemade dog biscuits cost a fraction of what you would pay for comparable quality dog biscuits at the store. In fact, you might save enough to pay for a cookbook—the first time you bake dog biscuits! Control the ingredients - When you bake your own dog biscuits, you have absolute control over what goes into them! You can use only healthy ingredients, and you can choose ingredients that will give you healthy dog biscuits! Special needs – If you have a dog with special needs-–diabetic, arthritis, heart condition, overweight, sensitive stomach—you can bake dog treats that meet your dog’s nutritional and dietary needs. Fun - Perhaps the best reason to bake for your dog, is that it really is lots of fun! Dogs are very appreciative of your efforts, and you’ll find that, when you bake dog biscuits, you will have canine company in the kitchen! You may have other reasons for baking dog treats. These are the ones that I considered. But, no matter what your reasons—baking dog treats is a fun activity—for both you and your dog!